The interest in the sport of swimrun nowadays is clearly not limited to Swedes so I thought it’d be considerate and write this in English. 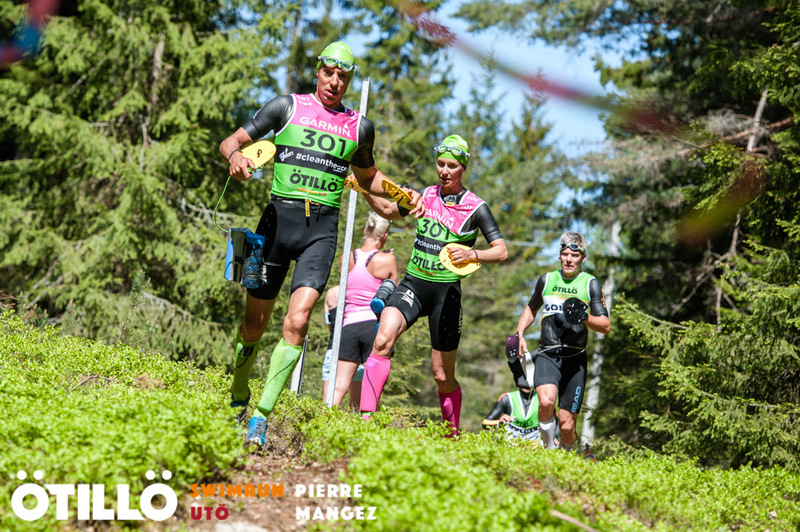 Anyway, last weekend me and Tomas Granberg raced ÖTILLÖ Swimrun Utö as the team TG Swimrun. It’s the second World Series event of the year after Hvar in Croatia and I’d say it is the second most competitive swimrun race on the planet (don’t know about Mars or Jupiter) after the World Champs. This year, the competition at Utö really took a huge step up. Take our team as an example: 11 min faster this year but finished 17 total compared to 9 total last year. This year, Utö became a confluence of fast teams. There where no new teams in the top 10, but most of the top athletes of the sport had decided to participate, although still missing names such as Hanson, Moberg, Krochak and Olsson. 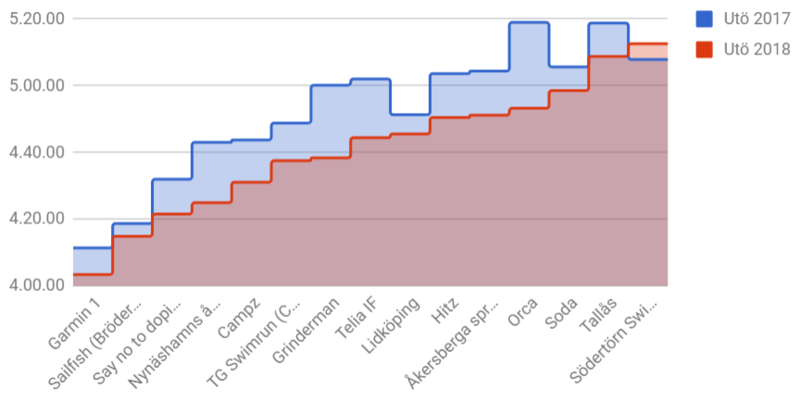 I decided to take a closer look at the performances of the top 50 teams at Utö this year. 16 of the teams raced the same event in 2017, when conditions were very similar to this year’s conditions. Comparing the times I noticed that almost all of the 16 teams were faster this year yet very few managed to defend their positions, just like us. Deeper front and a step up in performance all across the field. Team finishing times, 2017 compared to 2018. 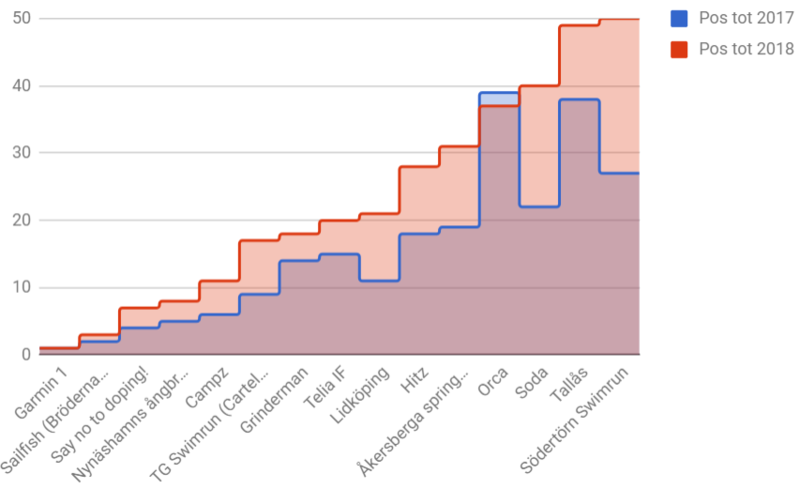 Team finishing positions, 2017 compared to 2018. I think you get the idea. Competition is getting tougher mainly because the existing athletes are becoming faster as they devote more effort to swimrun. The World Series race at Utö is mainly a Swedish concern, although 20 some teams where from outside of Sweden. Regardless, the sharp end is predominantly Swedish. Probably we’ll see national and regional competition sharpening at races in other places around the world the next few years. There has been some talk in Sweden about athletes transitioning from related sports to swimrun, raising the standard at the front end. I think that already happend and there is not much more to expect from that in Sweden. We already have Swedish top end triathletes in swimrun: Pontus Lindberg (8:11 Ironman), George Bjälkemo (several national medals in mid distance), Eva Nyström (four national gold medals), Jesper Svensson, Oscar Olsson etc. From adventure racing/multiport we have top international level athletes such as Daniel Hansson, Kristin Larsson and Martin Flinta. I think that at this point the talent pool of endurance athletics in Sweden is pretty much exhausted. There are some obvious world-class athletes fans of the swimrun would like to one day see at ÖTILLÖ, like Åsa Lundström and Patrik Nilsson (eighth in Kona 2017). However, I don’t think the time is ripe just yet for these people as they need to focus 100 % on triathlon. It would be unexpected of a young triathlete to venture off while still in the top international game of a much bigger sport, like Patrik Nilsson is. However maybe some more cases of guest appearances as by active pro triathlete Jesper Svensson while still maintaining their careers in triathlon? Mixed category lead pack about 1/4 into the race at Utö 2018: Thomas Schreven (NED) and Jasmina Glad-Schreven (FIN) of Say No to Doping! and Martin Flinta (SWE) and Helena Karaskova Erbenova (CZE?) of Thule Adventure Team. Photo: Pierre Manges/ÖTILLÖ. Anyway, back to the World Series race at Utö. I’ve done the race four times now, 2015 onwards. I’d recommend bringing a neoprene bandana as normal condition at Utö mean some swims will be a bit cold. However, I’m not a fan of long sleeve or leg wetsuits. That’s not where I get cold anyway, and they’d be a huge disadvantage on the runs. Sleeves and legs as short as possible since the cold really just gets to my face and forehead anyway. We actually rolled down the top of our wetsuits during the 7 km long run this year. I’m not fully sure that was the best choice as it takes some time and fiddling, but it sure was comfortable. Wetsuit designers have the last few years designed shorter front zippers which I think is a bad idea. Sure, very marginal gains on drag, but the running is much more uncomfortable when you can’t zip down properly. More about the characteristics of this race, it is a race of short but many swims. Transition efficiency is key. Also, runs are a mix of heavy terrain and flat runnable. To do well at this race you have to be able to run the 7 km flat gravel in the middle of the race at a high pace. If you are a fast off-trail runner, make sure to exit the swims leading into the wilder land sections ahead of any possible packs because at narrow paths overtaking may prove difficult. 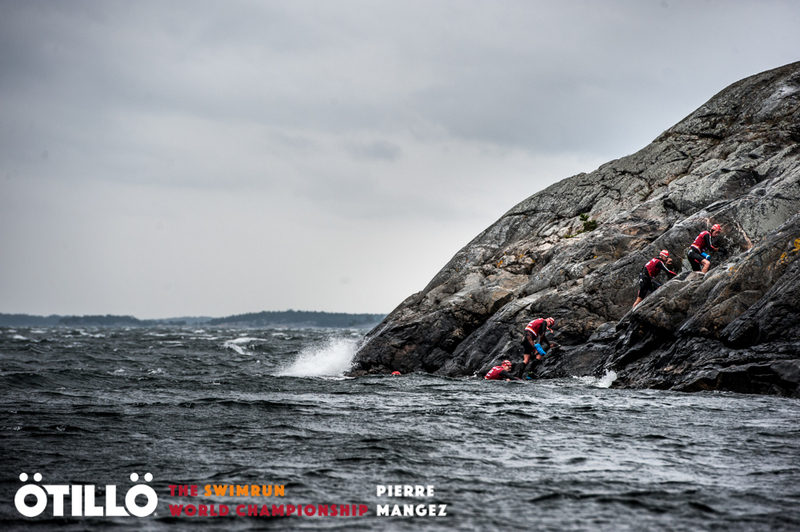 All in all, Utö is a compressed version of the World Championship race with the WC being more of everything: longer runnable section on Ornö, even tougher terrain at large sections, longer and more exposed swims. However, the terrain is is very beautiful, but maybe not at unbelievable as at the WC. I leave you with scenery from the World Champs of last year. Can’t wait until the first Monday of September! Photo: Pierre Mangez / Ötillö.